A fine stringed instrument is designed to last for hundreds of years. Amazingly, many fine instruments built 200 to 300 years ago are still used daily by professional musicians! However, carelessness or neglect can greatly shorten the life of an instrument. To keep your MSR rental in the best possible condition, we offer this guide to assist you in maintaining your instrument and bow. 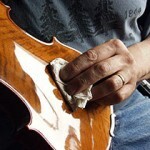 Wipe off the instrument and strings with a soft, clean, lint-free cloth. Loosen the bow until the hair touches the stick. 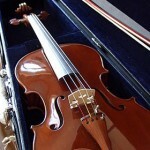 Put both the instrument (without the shoulder rest) and the bow back in your case and close the case. Continue reading below to learn more about how to keep your instrument looking and sounding its very best, or download a printable pdf on caring for your rental instrument and bow. Keep it clean: Wipe off your instrument and strings with a soft, clean lint-free cloth every time you finish playing to keep the varnish looking nice and prevent rosin dust buildup under the strings. The dust is very difficult to remove once it hardens. Always wash your hands before playing to avoid exposing the varnish to dirt or grease. Never use any type of polish (including furniture polish) or alcohol on your instrument; if rosin or dirt have built up heavily, bring your instrument to us for a professional cleaning. Prevent nicks and scratches: Not only does the varnish on your instrument add beauty to the wood, it also helps protect it and enhances the instrument’s sound. When playing, avoid wearing large, heavy jewelry, clothing with large buttons or metal zippers, belts with heavy buckles, or other items that could scratch the varnish. If bare wood is exposed through wear or damage, please bring the instrument to us for repair. 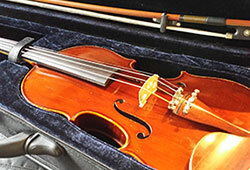 Store it in its case: The only place to keep your instrument or bow when you are not playing is in a closed case! Some of the most serious damage we have seen happened because an instrument was left on a chair, in an open case (especially with the shoulder rest still on), hanging on a music stand, or in the pathway of pets or young children. Unprotected instruments could be knocked over or hit by falling objects. Especially vulnerable are the soft spruce top and the edges, which can chip or break off. Make sure your case is working properly. The latch should be secure and the zipper around the case zipped before you pick up the case. If either of these is not working, bring the case to us for replacement. Protect from extreme conditions: Do not expose your instrument to high heat or humidity or extreme cold, even when in its case. This includes keeping it out of direct sunlight and away from heaters, and not leaving it inside a closed, unoccupied car or in the trunk. Direct sunlight, extreme temperatures, and liquids can all damage varnish and cause cracks in the wood. Should you notice a crack, bring the instrument to us immediately for repair. If left unrepaired, cracks may worsen and become more expensive to fix. 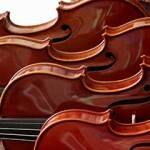 Avoid adhesives: Never put moleskin on your chinrest or on the violin as this damages the varnish. Do not use sticky tape (such as scotch tape) on the fingerboard since the residue is very difficult to remove. If you need to mark the fingerboard, use pinstriping tape, which may need to be replaced occasionally but does not leave much residue. Each bridge is individually cut and fitted to its instrument so that the feet fit the top exactly and the strings are the correct height above the fingerboard. Over time, normal pressure from the strings tends to pull the bridge toward the fingerboard; if the top of the bridge is not pulled back occasionally (we can show you how to do this yourself), the bridge may warp slightly or even fall over. If the bridge falls, loosen the strings, place a soft cloth under the tailpiece to protect the top from the tuners, and bring the instrument to us so we can reposition it in exactly the right place. If the bridge is not correctly positioned, the instrument will not sound its best, no matter how well you play. Properly fit pegs should be easy to tune and shouldn’t slip or stick. You will need to apply just a bit of inward pressure to the pegs as you turn them to tune, but please do not force them into their holes. If the pegs are hard to turn or don’t stay in place with just moderate pressure, bring the instrument in so we can fix the problem. The soundpost is fitted inside the instrument just behind the foot of the bridge on the side of the highest string. Its correct placement is critical to giving your instrument the best possible sound and it should be moved or adjusted only by an expert. If the post falls over, you’ll hear a rattling inside the instrument. If this happens, bring the instrument in to have the post set up properly. Strings may need to be replaced after about six months of use; around this time they lose responsiveness and quality of sound. If you need replacement strings, please have them changed by your teacher or by us. Since strings sometimes break unexpectedly before wearing out, it is a good idea to keep an extra set in your case. If you must change the strings yourself, do not take all them all off at once as this could make the soundpost fall. Also, be careful not to tune strings too high, since this could cause them to break. Like the instrument, the bow is fragile and needs proper care. The bow hair should be just tight enough so it doesn’t touch the stick when you play. Over-tightening can cause the bow to lose its curve and may even cause the stick to break. After playing, always remember to loosen the bow hair until it touches the stick. Avoid touching the hair as the oil from fingers can prevent rosin from sticking. Handle the bow with care. Never tap the stick on a music stand or any hard object and don’t leave the bow resting on your music stand when it’s not being used since a blow or fall could easily break the head. To prevent damage, put the bow back in your closed case after playing. Keep it away from direct sunlight, extreme temperatures, and liquids. Damaged bows can sometimes be repaired, but may lose most of their value. Occasionally, stringed instruments can develop a buzz or lose volume and quality of sound. Possible causes might include an open seam, a loose tuner, etc. Such problems are usually very easy to fix. Should issues with sound occur, please bring the instrument to us for repair. Thank you for your help in maintaining your rental instrument. By taking good care of your instrument, you are enabling us to continue providing you with high quality instruments at low rental rates. As you enjoy playing your Midwest String Rentals instrument, should you have any questions about its care, please do not hesitate to call us at 312.566.0429.